Apple and iTunes promise "day that you'll never forget"
We can barely remember yesterday, so this wil have to be good. Apple has revealed that it'll make an "exciting" iTunes-related announcement tomorrow via its website. 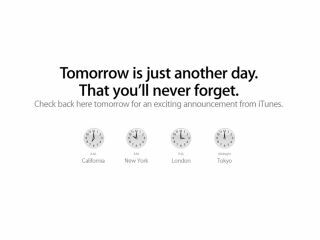 The front page of Apple.com is currently given up to a message that reads: "Tomorrow is just another day. That you'll never forget. Check back here tomorrow for an exciting announcement from iTunes." This being Apple, no clue has been given to what the news will be, but speculation is already mounting that it could relate to some sort of subscription or cloud-based music service. And then there's the old digital chestnut that is The Beatles' back catalogue finally being made available online. In truth, though, no one outside of Apple currently knows what's going on, but all will be revealed at 3pm (UK time) tomorrow.